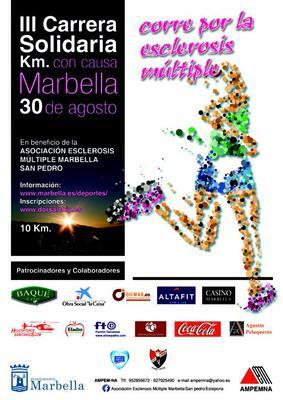 Mark your calendars for another great 10K in Marbella this summer. Among the sponsors will be Helicopteros Sanitarios delivering peace of mind to families on the Costa del Sol for over 20 years. The III Carrera Solidaria will be a fantastic way to get out and show your support for the fight against Multiple Sclerosis. There will also be a "Mini 2K" for those that want to participate. Dorsals will be available on August 29th, from 19'00 h to 20'30 H In The Palacio De Congresos of Marbella (Avda José Melia). Timing chips will also be distributed then with a gift bag and T-shirt. The day of the test, August 30, between 8'30 h and 9'30 h will open accreditation of those who have not collected the day before, half an hour before the exit. There will be trophies for 1st, 2nd and 3rd place mens and womens categories. Start training and get ready for a great time! If we find additional information, we will definitely post it here. Please let us know the route, where the race will start and end thanks!!! Hope that helps! Let us know if you have any additional questions and enjoy the race!